A Grande Prairie photographer recently got up close and personal with a cat fight — a big cat fight. Amos Wiebe was driving down a logging road near Grande Prairie on the evening of March 21 when he noticed something in the trees. The hobby photographer was out looking for owls, but what he saw was somewhat more ferocious: two lynx, chasing each other up a tree. He slammed on the brakes and decided to get a little closer. After walking through about four feet of snow for half an hour, he finally reached the tree. By then, the lynx that he figured was a male had walked away. But he stayed and shot some photos of the female as she remained sitting in the tree. She seemed distracted, staring past his head. 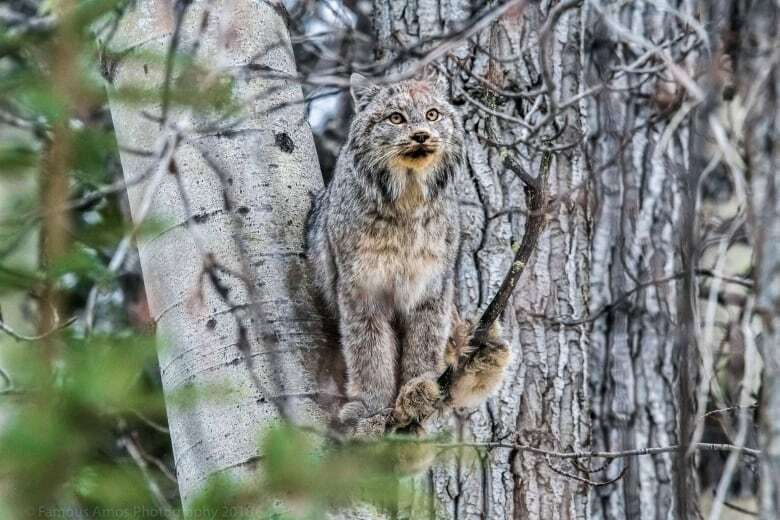 "All of a sudden I heard screaming behind me and then two more lynx came running right about seven to 10 feet behind me," Wiebe said. "I had two cans of bear spray and pulled the valves just for safety reasons. They just went running right by me. And the one cruises right back up the tree and starts chasing her again. She's just swinging and screaming, it was pretty wild. "Those trees were huge and how they just ran up them like there was nothing to it. It kind of puts a fear into you." As the lynx duked it out around 100 feet above him, Wiebe caught it all on camera. Eventually, the male lynx gingerly stepped down from the tree and walked away with the female that had been following him. He stayed until dusk watching the remaining female lynx in the tree, then walked back to his truck. He later posted the photos and video to his Facebook page, Famous Amos Photography. Wiebe, who manages a storage facility in Grande Prairie, doesn't want to say exactly where he spotted the lynx. He wants to ensure they aren't bothered. He says there have been a lot of rabbits in the Grande Prairie area this year, so he's seen a lot of lynx around. But this sighting was different — he says witnessing the lovers' quarrel was one of the most amazing experiences of his life. "They were obviously in heat," he said. "But the screaming was just ... chilling. It was just, make your hair stand on edge. The excitement was just unreal."